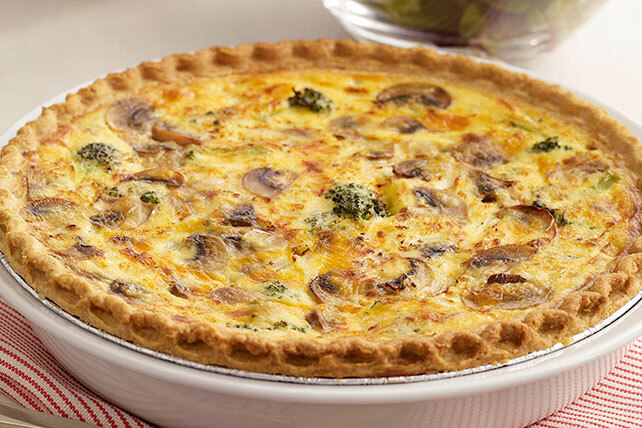 Discover an easy-to-make Vegetable and Cheese Quiche that's perfect for brunch. This Vegetable and Cheese Quiche includes your favorite veggies and cheddar. Beat eggs, dressing and milk in medium bowl with whisk until blended. Stir in vegetable mixture and cheese; pour into pie crust. Place on baking sheet. Bake 40 to 45 min. or until center of quiche is set and top is golden brown. Let stand 10 min. before slicing to serve. Serve this easy-to-make any-night quiche with a mixed green salad to round out the meal. For extra color, add 1/4 cup chopped roasted red peppers to filling before pouring into pie crust.